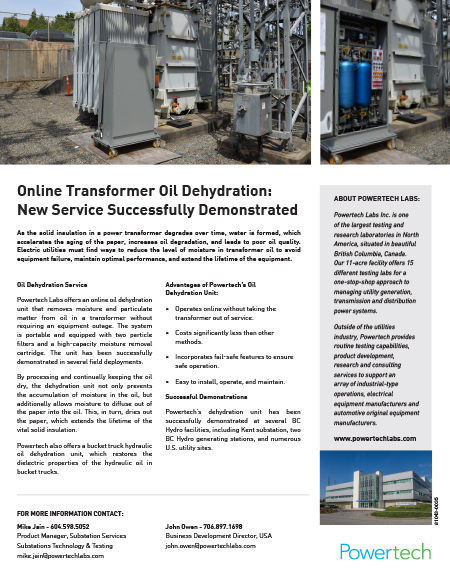 Powertech offers on-line oil treatment technologies that restore oil quality without requiring equipment outages. These systems are attached directly to in-service equipment and operate by flowing the oil in a by-pass mode. The technologies are modular, and depending on the need, different cartridges can be installed on one unit for decontamination of specific contaminants. Application helps utilities maintain optimal transformer operation, while prolonging life. —From Powertech’s Applied Chemistry Department, an industry leader in transformer research and development. Please contact Powertech for details on purchase or rental for your transformers.